Usually, the third and fourth passengers in the same cabin of a cruise ship get a discount, or at worse, they are accessed the same price as the first two guests. That is why I am surprised to see for some Princess cruises, it actually costs the SAME as getting 2 separate cabins versus 3 people in one stateroom. 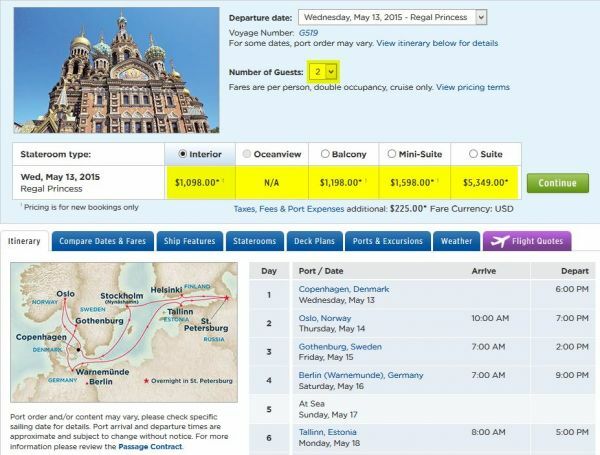 For example, the 5/11/2015 11 night Baltic sailing on the Regal Princess out of Copenhagen, the balcony is $1198/pp for 2. For single occupancy, the balcony is $2396 (which is 2 * $1198). So the total for 3 people in 2 cabins is: $1198 * 2 + $2396 = $4792. And now, if I switch the number of guests to 2, the price jumps to $1,398/pp, and the third passenger is $1,498/pp. That is a phenomenon I have never seen before- the third guest rate HIGHER than the first two in the same room. The total is now $4292. So okay not quite as much as 2 separate balcony cabins, but let's take a look at the inside pricing. Two people = 2* $1098, + single ($2195.40) = $4391.40 for 2 interiors totaling 3 guests. If you are trying to fit 3 passengers into one interior stateroom, however, the price for the first two jumps to $1599 (more than balcony), and guest 3 is $1074. The total is now $4272, which is only $100 less than 2 separate cabins. That is total for $6694 ($1898 * 2 + $1449 * 2) for 4 in one single balcony cabin, versus $4392 for 2 separate cabins. So it costs $2302 more to stay in the same stateroom for 4 versus 2 separate ones holding 2 guests each. WOW. It is likely that Princess Cruises is trying to sell as many cabins ASAP and is not as worried about the number of total guests on the ship. Unfortunately this strategy may backfire because it dissuades traveling families who want/need to be in the same cabin, resulting in them booking with another company offering a similar itinerary/dates. For most other cruise lines, the first and second person rates do not rise when you add 3rd/4th guests, and certainly the total cost would be significantly cheaper than 2 separate staterooms, not similar or more expensive in this case.